Mr.Kavan Ratnayaka has been appointed the new Chairman of Sri Lanka Ports Authority (SLPA). Mr.Ratnayaka assumed duties as the Chairman of Sri Lanka Ports Authority (SLPA) today, 17.01.2019 with blessings of the Triple Gem at the Chairman’s office of SLPA. Speaking at the event, Hon.Minister of Port, Shipping and Southern Development Sagala Ratnayaka remarked of the commendable path taken by Sri Lanka Ports Authority as a pioneer public sector institution that contributed tremendously to the national treasury since the period of late Minister of Port Development Hon.Lalith Athulathmudali. Hon.Minister Lalith Athulathmudali of the Government of His Excellency the President J.R.Jayawardhane created a revolutionary change in the port and maritime sector of Sri Lanka. As a result, more public-private partnerships emerged with collaborative competition in the country’s port sector. The Minister also stated that the port of Colombo that has almost reached to its capacity with collaborative teamwork of the Jaya Container Terminal of Sri Lanka Ports Authority (SLPA), the South Asia Gateway Terminals and the Colombo International Container Terminals should be further developed into one of the leading ports of the world. The Minister expressed his confidence that Mr.Kavan Ratnayaka as the new Chairman of Sri Lanka Ports Authority (SLPA), with experience in both public and private sector will steer Sri Lanka port Authority and the Port of Colombo to this position. Before his appointment as the Chairman of SLPA, Mr.Kavan Ratnayaka served the Chairman of the Sri Lanka Tourism Development Authority (SLTDA). He is also a former Chairman of Associated Newspapers of Ceylon (Lake House). An old boy of Royal College, Mr.Kavan Ratnayaka holds a Bachelor of Science degree in (Physics) of the University of California. He has also served as the Country General Manager of IBM Sri Lanka, Chief Executive Officer of Dialog Broadband and the Chief Corporate Officer of Dialog Axiata PLC. Gampaha District Hon.Member of Parliament – Kavinda Jayawardhane, the Managing Director of Sri Lanka Ports Authority (SLPA) – Capt.Athula Hewavitharana, Additional Managing Director of Sri Lanka Ports Authority (SLPA) – Mr.Upali D. Zoysa, Directors and a number of higher officials of the management and staffs of Sri Lanka Ports Authority (SLPA), President of the Jathika Sewaka Sangamaya (JSS) of Sri Lanka Ports Authority (SLPA) – Mr.Udeni Kaluthanthri also attended the event. 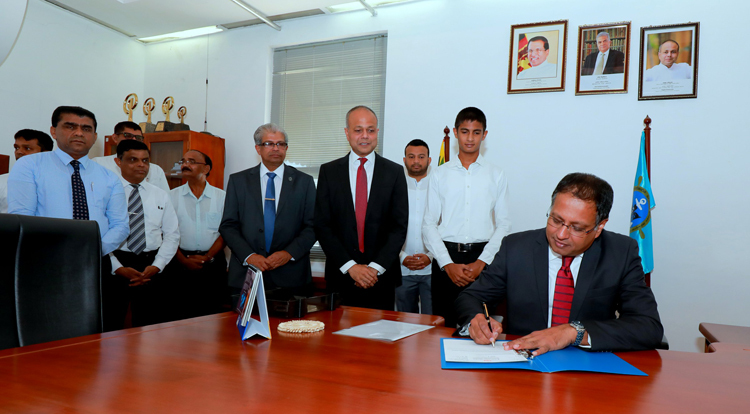 Photo - Mr.Kavan Ratnayaka assumes duties as the Chairman of Sri Lanka Ports Authority (SLPA). Hon.Minister of Port, Shipping and Southern Development Sagala Ratnayaka, Gampaha District Hon.Member of Parliament – Kavinda Jayawardhane, the Managing Director of Sri Lanka Ports Authority (SLPA) – Capt.Athula Hewavitharana and the Additional Managing Director of Sri Lanka Ports Authority (SLPA) – Mr.Upali D. Zoysa are also in the picture.